PAL Review by SKTTR and Rukiafan. Welcome to another review on WiiWareWave. This time we have a casual dart game from Spanish development team and publisher EnjoyUp Games. 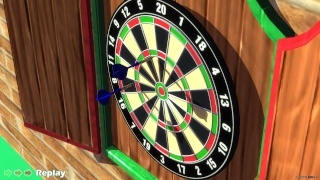 In Darts Up you're playing exclusively with the Wii U GamePad, no Wiimotes or other controllers allowed. It's just holding the GamePad up to the dartboard and fling one of the two sticks to throw a dart. There's no crosshair or pointer to indicate where you're throwing. It's all about getting a feel of where to aim, just like in real life. However, throwing a Bull's Eye is pretty easy as your standard position at the beginning of every throw is the central position. If you hold still, throwing Bull's Eyes isn't much of a problem. As you move the GamePad you can look around not only the dartboard but the whole arcade playground the game takes place in. It's a neat feature as it gives you a bit of freedom of where to look at but it appears useless as you're not able to throw darts if you're not pointing in the direction of the dartboard. Unfortunately that means no secret Easter Eggs because no throwing darts on the Chronos Twins and Gaia's Moon arcade cabinets. So let's focus on the dartboard again. There are 3 multiplayer modes and 1 singleplayer mode. Darts on consoles have always been a casual experience, best suited for multiplayer with friends or family, and especially on a game partys. Combined with the new GamePad controls and an online leaderboard for singleplayer, that's where the value of this 2,49€ game lies, because it doesn't really show off in graphics, options, or content. All multiplayer modes can be played with up to 4 human players (no computer controlled players available). Having only 4 human players is kinda limiting because it's a game where you hand off the GamePad to the next player when your round is over. The devs could have easily added an option for more players. 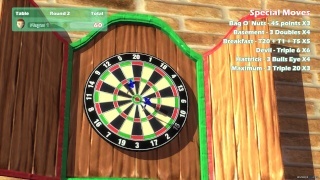 Furthermore, the TV screen is showing the dart board from its own "action-cam" perspective. That means other players can't see what the GamePad player is doing until the dart hits the board. Also, the game is using EnjoyUp's own Mii-lookalikes, not real Nintendo-Miis. There are 16 Mii-clones to choose from with many pink-, violet-, green- and blue-haired guys'n girls but only one white guy with black hair. That means that there'll rarely be a match where the ingame characters match the appearance of their players. It doesn't matter who you pick though, as long as you remember the face you picked in the multiplayer sessions, but it's somewhat disappointing because EnjoyUp has used real Miis in earlier games like Family&Friends Party and Football/Soccer Up on WiiWare. 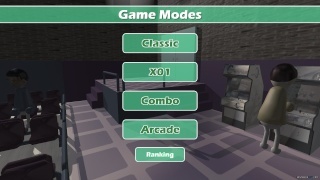 Let's have a look at the different game modes! The Classic Mode is where you try to get as many points as possible, preferably by hitting the 3x20pts or the Bull's Eye (50pts) in 3, 6, or 9 rounds. In the X01 Mode you try to be first to get 101, 301, 501 or 701pts in an endless amount of rounds. You can select if you want to play with Double In rules and Double Out rules (your first and/or last throw needs to hit one of the outer rings). Double Out rule is my personal favourite because there's just so much of excitement at the end of a match. The third and last multiplayer mode is the Combo Mode in where you have to aim at specific parts of the board (shown on the TV) to perform 6 different special moves to rack up more points. A "Hattrick" is hitting the Bull's Eye 3 times, a "Devil" is hitting the Triple 6, a "Maximum" is hitting three Triple 20, etc. Again 3, 6, or 9 rounds can be selected. Unfortunately no highscores are saved for the three multiplayer modes. Finally there's the single player mode, called Arcade Mode, which is played level by level. In every level you have 3 rounds (with 3 darts per round) to beat a target score (and rack up even more points beyond that). As long as you reach the target score the next level will be available with a higher target score. The special moves from Combo Mode are also available here, but can only be done once per game, so there's also a bit of strategy involved. The game is over if you don't reach the target and your score is uploaded to the online leaderboards. The leaderboards show the Global Top 8, your friends ranking, and your own spot in the rankings. Coming to an end, there's really nothing wrong with the game. It's a budget title that doesn't hide much of its handheld roots. It's not trying to be a realistic darts simulation and there's a Cricket Mode sorely missing, but it's a fun distraction anyway. If you're into party games this is very well worth its low asking price. Darts fans will definately find enjoyment in climbing the leaderboards as well. 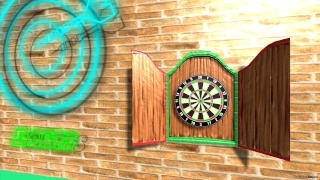 Darts up is a fantastic game for what it is, but its appeal is certainly very niche. That said almost everything about this game has been wonderfully crafted and is very high quality. The physics are nearly flawless, there aren't very many glitches or bugs, etc. The graphics are reasonable for this kind of game as are the SFX! All in all the game is a quality title that any fan of darts should own! @SKTTR which is better game Wii U or 3DS version? @Midnafanatic wrote: @SKTTR which is better game Wii U or 3DS version? I haven't played Darts Up 3D, but from the information I gathered, the 3DS version has real Miis and it has stereoscopic 3D. I don't know what else is better in the 3DS version. It's missing the online leaderboard though. Great review! Thanks for writing so much quality content for us lately. Thanks, not my flavor either, but I can see how it's enjoyable for certain gamers (like my friends). Two of them actually downloaded the game after playing this with me. Rukiafan wrote: Great review! Thanks for writing so much quality content for us lately. Thanks for sending so many games lately! My second opinion of the game has gone live making this the first NA/PAL region review! Pokefreak wrote: Awesome review dude! Rukiafan wrote: My second opinion of the game has gone live making this the first NA/PAL region review! It's either NA/EU region or NTSC/PAL region. I never understood why Australia is a part of the EU region since it's actually in Oceania that's why I try to call the EU region the PAL region, but I understand that the two are one in the same.